Dysart Woods is the largest known (51 acres) of unglaciated primeval oak forest in Southeastern Ohio. 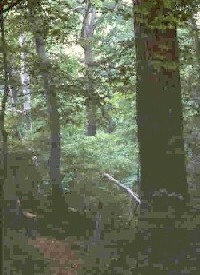 The virgin forest, with specimens 300-400 years old, is a National Natural Landmark and botanical research laboratory of Ohio University and the Eastern Campus. Follow the footpaths. No restrooms. For a description of early settler life (starting about 1800) in the "big woods" less than fifteen miles from Dysart Woods, see: Ohio Revisited: Belmont County, Part 14 -- Life in the Woods Near St. Clairsville.